There is about a day left until the giveaway entry closed, please have a look at this blog post if you haven't checked it! I am consuming the fabrics that I bought on the meeting trip, one by one, from top to bottom of the pile. 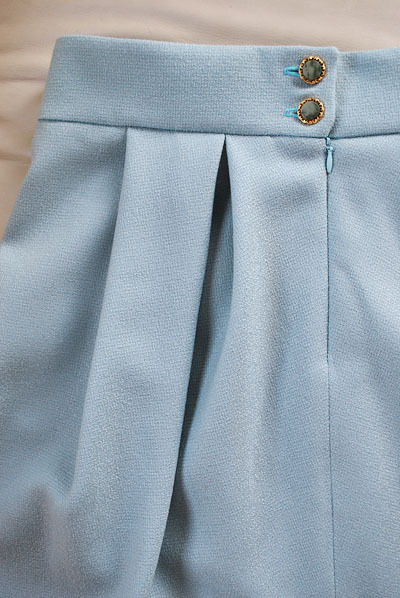 I made a skirt in this peppermint blue fabric which probably consisted of wool/something synthetic blend. I thought this was an ideal fabric for a skirt when I bought, since it was soft, and seemed creating beautiful drapes. To say more, I found that any crease could not stay after the hardest grasp in my hand, even for a moment. It just seemed so suitable for a skirt (at that time). Oh yes it is Crease-Less! The worst part of everything about it was that I didn't remember that ironing this fabric would be a nightmare. Crease-less means no-neat-pressing when sewing, how can I forget it? It was so quick to have this skirt almost done, but I had to have long 3 days of thinking about the relationship between a clean hem and the character of creaselessness. I did almost everything that I could imagine, but it was very difficult to get a nice hem on this skirt because I couldn't press. 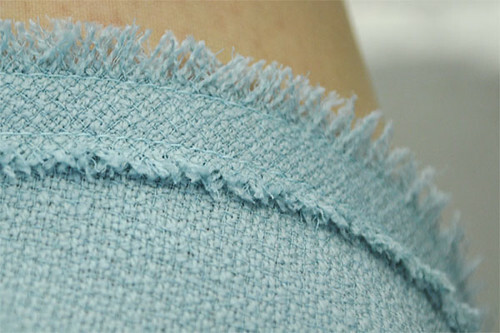 The fabric was completely ironing-resistant. It also hated invisible hand stitching. It frayed soon after cutting. It disfavored the heaviness of a facings on its hemline. I had no hope on hemming it! I then went for looking for a matching braid for the hem. I couldn't find anything nice. Said that, I now have a solution as you see. I'm happy with what I did! I ended up with 1) overlocking the raw edge of its hem, 2) putting a narrow tape which was cut in bias in the same fabric onto slightly lower but almost over the hemline, 3) double stitching the tape onto the skirt, 4) and loosening the edges of the tape to give it a "fringe look". I didn't need hand stitching, ironing, or facing. I got a look. Best ending I could imagine! fabric: wool/polyester(?)/viscose(?) woven, soft, tweed-y, crease-less in peppermint/blue. 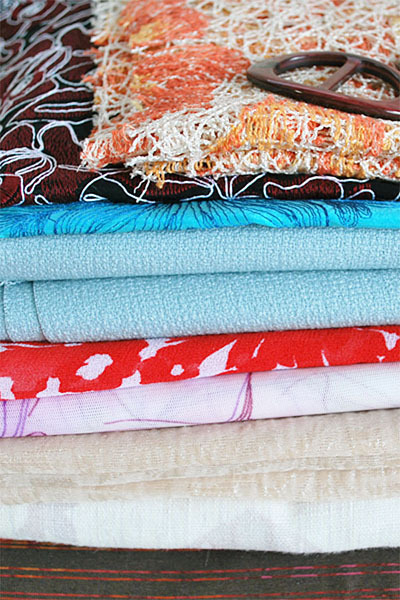 I got some scraps of fabric, as I had an weekend trip which ended up dropping by my favorite fabric shop. 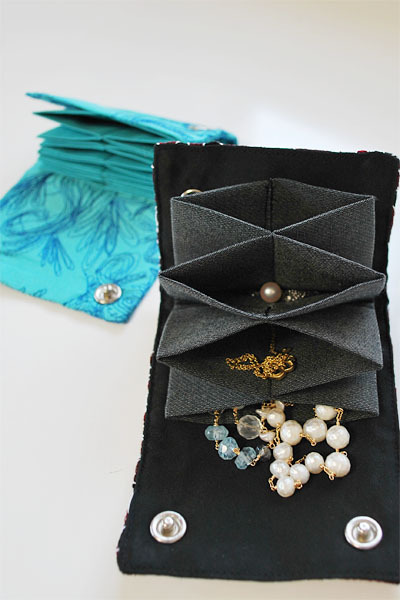 When I saw the pretty Usherwoodc's Earring Travel Case at BurdaStyle quite some time ago, I knew I'd love to have one for me too. I always carry my favorite necklaces with me in my bag, so that I can swap one for another whenever I feel a BAD-NECKLACE-DAY. I rarely do swapping because of my laziness, though. My habit of carrying necklaces just makes my favorites tangled. Anyway, I was very much inspired by her creation. 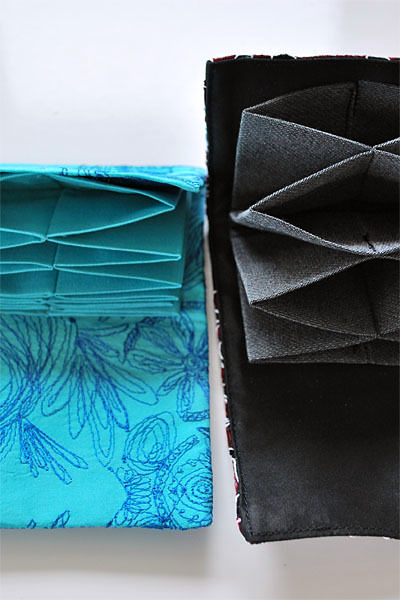 I loved the idea of separated rooms for individual accessories in one textile package. The problem was, I didn't quite get its construction through the pictures. I gradually gave up thinking about it... and forgot everything. Last week, it suddenly hit me again, and this time it was for my friend's. I had a plan for an weekend trip to see my friends, and I needed to prepare a gift by then. Everybody was supposed to bring one something small for our gift-swapping at the meeting. I thought this accessory carrying sachet accompanied with a pretty small bracelet would make a lovely gift. So I made it in a leopard printed cotton, and it was really cute! Actually it looked even cuter when it had a small bracelet in it. The recipient seemed very happy with my gift, and it was a really happy meeting for me too. Having noticed that my one was differently constructed from Usherwoodc's in the process of thinking&making my gift, I couldn't resist to try the original version (please allow me to say so) with 6 pockets in a turquoise silk shantung with pretty embroidery. 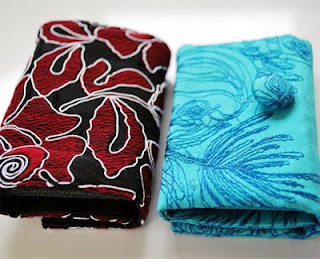 The turquoise one turned small because of the limitation of my fabric resource. As it has many pockets in a small body, this one now seems specialized for tiny accessories like earrings and simple rings. Then I made another one in my method in a slightly larger size, using the black cotton lace with flower embroidery and a matching gray cotton/polyester. My method can make 4 pockets (no more, no less) in a sachet. Neither can keep chunky accessories inside, but I think such things have to be held individually anyway. Those are for small things, and I love the way they are. Did I tell you that I made my own one before I had a go on the gift for my friend? Yes, I have made four of them so far, and of course the last two were made for you. Would you like to have one, I mean, either of these two I have made? If so, please leave a comment below. Please include a link to your blog/homepage, or leave either of your twitter name or valid email address within your comment, so that I can ask your posting address and your choice. Yes, this is a kind of giveaways, if you say so. If there are more than one person who would like to get, could you please let me decide which one is going to be yours. If there are more than two.. two winners will be chosen at random and then announced in this post. I will accept comments as the entries until 9:00 am GST on TuesdayFriday, February 26th. I live in Japan, but don't worry. I will post my envelope to you as long as your address is on our planet. Also, you have to be warned in advance that I felt they were wee bit tricky to assemble (obviously I'm avoiding the word "sew". it wasn't my usual "sewing" at all!) I tried my best though. They were rather small and too thick to handle. Do excuse me for those funny stitches, please. Note that the covered button goes with the shantung sachet, but they are not attached. I made the button for a part of closure, but it didn't look right. I love the idea so much, and it made me wish to share my imperfect yet ideal gadget with you. Hope you'll like it. I used True Random Number Generator for choosing winners. The two winners are woolcat and Krissy. Congratulations on winning my giveaway sachets! Thank you, all of you ladies, for leaving kind comments on the sachets. It may be difficult for me to post a real tutorial, but I'll try to explain how to create the pockets in the future post. Thank you again, and Happy sewing! I've got this mohair wool jersey in the color of cocoa powder and made a cardigan from it. I love the texture of the fabric, it's so so so soft and fluffy. I look like a teddy bear in it, but I don't care! I'm a very special teddy bear that speaks like a human. By the way, I'm not working in a tailored suit or in an uniform in the daytime. I have to say that I don't often have chances to dress up in silk dresses either. I just live in very casual sets of clothes on most days of my life. So, I need to feed those everyday clothes such as this cardigan for my everyday life to the wardrobe with my beloved sewing machine. The good thing is, I love sewing *boring* clothes! I'm having a great fun giving a bit of prettiness (and a handful weirdness) to my very ordinary wardrobe. I think that hobby seamstresses/seamsters are a bunch of lucky people who can control and improve what to wear. I put some red buttons to this long brown cardigan as an accent and I'm pretty happy with the result! 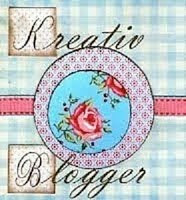 Thanks so much, EmilyKate, for awarding me with this Kreativ Blogger Award. I normally write only about sewing and my thoughts of sewing, but today I'd like to share seven things about myself which you might not know. 1. I'm allergic to mushrooms. I was taking the tablets which contained very concentrated extract from Agaricales Grifola (a kind of mushroom) as a dietary supplement when I was around 20 years old. Taking too much one ingredient can cause allergy, of course, and I'm now heavily allergic to any mushroom. Sigh. 2. 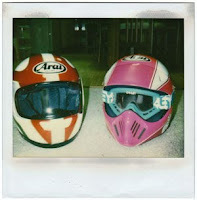 I was a motocross racer. Before starting my scientific carrier, I was racing and jumping around on the muddy course. I have to confess that I wasn't that fast in the races. To confess more, I'm seriously short of the competitive spirit. Generally, I am not interested in winning and seldom jealous. My angry manager once told me to never try to let anybody get ahead of me in the race. It seems a very reasonable advice, but please take it differently. I was a stupid rider who was most likely to move to the unexpected direction for giving them a way intentionally to let them pass (because they looked so eager to go), and then crushed oneself off the course (if you are concentrated going ahead, you wouldn't go "off" the course). I wanted to be faster because it was fun, but not because I wanted to win. I was rather good on the course alone, but hopeless in the race. I analyze that this is also why I'm not a promising scientist either. I am not willing to beat other competitors. I do love participating in some role in science to understand a tiny bit of the real truth of universe, and that's all I need (but it's not enough to make a life as a professional scientist of course). I have failed in many aspects in my life with this deficient and inner-directed character of mine, but I am always happy with myself even in the games I was losing. And if I don't need to enter the competition, I'd be even happier. However, at the same time, I know it just sounds that I'm always giving myself a good excuse to be lazy and preparing to be a loser. So I rarely tell this feeling to others. Sewing is a spotlessly complete joy for me, because I can be good and satisfy myself with the results but I don't need to win over anybody to carry on. 3. I love to stay and sit beside my washing machine, looking at it tumbling. 4. I once had wanted to be a hacker. Do you remember the line "It's a UNIX system. I know this..." in Jurassic Park? I'm not arguing with you about whether it was actually UNIX or not, but I tell you that I once wished to be very familiar with computer programming and scripts. I thought she was pretty cool to be able to say so in this critical situation. 5. I know the blackmailer. I hope it sounds amusing for you and surprising for R.
6. My husband and I only have wedding anniversaries once four years, in the olympic years. When we got married long time ago, I had to wear this traditional but hideous outfit by the request of my mother-in-law. It wasn't for wedding, it was just for a photoshoot, though. I was being dressed by the two of Kimono experts, in this old photo. 7. I have a husband who happily clapped his hands with his joy saying "OH. You got the EXTRA bonus nemesis points! ", reading a blog post from Selfish Seamstress. According to the rules, I should now nominate seven blogs that I feel deserve this award. Although there are many creative bloggers who I'd love to read their stories, I'd like to announce less than seven this time. I am usually too shy to leave a comment when I visit their blogs. I just don't want to surprise them by leaving my first-ever comment which brings this award! Elaine: who always knows what to do for the best result in sewing, and also a brilliant and sensible writer with the greatest sense of humor.